Yes, cappuccino IS Italian! Outside Italy we often consume cappuccino after a meal. 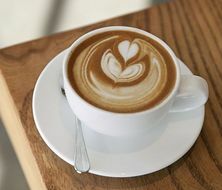 However, in Italy it is impossible to think of drinking a cappuccino after lunch or dinner; the only time you can actually drink a cappuccino is during breakfast. This salad, which has the name of its supposed Italian creator, is almost unknown in Italy. Pasta and rice as a side dish are consumed in several countries though Italians eat pasta or rice (risotto) as a first dish; a bit like an entrance. So remember, never order pasta or rice as a side dish in Italy, Italians would look at you like if you were a creep! Spaghetti Bolognese is a famous Italian recipe worldwide, but Italians do not actually eat spaghetti with Bolognese sauce: they use tagliatelle and the sauce is not called Bolognese but simply “ragú”. 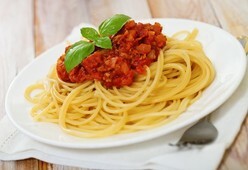 If you want to learn more about this dish check this article: 5 things you didn’t know about spaghetti Bolognese. The fettuccine Alfredo is the most famous “Italian” dish in the United States however it is nearly unknown in Italy. It was created in Rome by the chef Afredo Di Lelio and has become really popular overseas. It is the symbol of Rome for lots of American tourists. So when Americans visit Italy they always expect to try this dish but you can barely find it in any restaurant. Do you know this movie in which two cute dogs are served a plate of spaghetti with large meatballs? This recipe is known as Italian in America but is does not exist in Italy. Meatballs exist in Italy but we just don’t mix them with spaghetti! Lots of Americans love to eat pasta with chicken sauce and oftenly look for Italian recipes of this dish. They can look for long time because recipes of pasta with chicken does not exist in Italy. This is for sure the most shocking combination that can exist for an Italian. Yes, ketchup has the same colour than tomato sauce however it does not convert it in a tasty pasta sauce! It could nearly be considered as a crime in Italy! 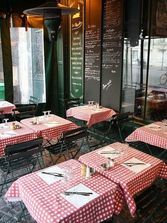 It could seem strange for lots of Italians, but these tablecloths are universally associated with Italian food abroad and almost every Italian restaurant abroad uses them. Just make a tour in New Work’s Little Italy and count how much you can find! Don’t be disappointed not to find these when you’ll be visiting Italy! In the United States pepperoni is hot salami; in Italy peperoni are bell peppers. So if you order a peperoni pizza you’ll be disappointed. If you want a spicy pizza order one with salame piccante.